At times, it can feel like you are on an island without the support and understanding needed to do the job. But the reality is that there is an entire industry of people just like you in Manitoba – experiencing the same challenges, the same issues and the same emotions. 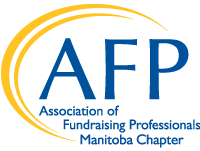 AFP Manitoba is more than an opportunity to “network”. It is a network of like-minded individuals – willing to provide information, support and guidance to help you in your own work experience. As an AFP member, you can find peers that share in your struggles and help you find your footing; a community where you can be refreshed to take on the challenges of tomorrow; where you can go for inspiration, resources, policy, and ideas. Join a group of passionate people – passionate about the industry, passionate about the community, and passionate about affecting change!